Anton Pavlovich Chekhov (Russian: Антон Павлович Чехов) was a Russian physician, dramatist and author who is considered to be among the greatest writers of short stories in history. His career as a dramatist produced four classics and his best short stories are held in high esteem by writers and critics. 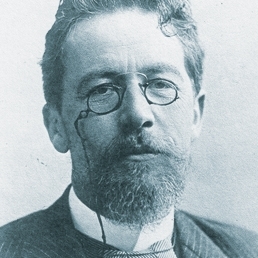 Chekhov practiced as a doctor throughout most of his literary career: "Medicine is my lawful wife," he once said, "and literature is my mistress." Chekhov renounced the theatre after the disastrous reception of The Seagull in 1896, but the play was revived to acclaim in 1898 by Constantin Stanislavski's Moscow Art Theatre, which subsequently also produced Chekhov's Uncle Vanya and premiered his last two plays, Three Sisters and The Cherry Orchard. These four works present a challenge to the acting ensemble as well as to audiences, because in place of conventional action Chekhov offers a "theatre of mood" and a "submerged life in the text."